Last week I was doing some 'condition assessment' of blanket bog sites in Northumberland for as part of a nation-wide survey for Natural England. We have to use a ridiculous method which can't possibly tell you what condition the bog is in, but that's another story! One day on a very remote site in Northumberland, my co-surveyor Fiona came back to the car at lunch time with a twig of Betula nana (dwarf birch) in her hand. I couldn't believe my eyes and got very excited as I knew there were only 2 native sites for it in England. When I say 2 sites I really mean 2 bushes (ok, one of the sites has 2 tiny bushes quite close together). I also knew that one of the sites was somewhere in the Northumberland hills but I thought the chances of Fiona stumbling upon that site by accident in such a remote place were extremely slim. Well believe it or not that's exactly what happened. What are the chances of that happening? neither of us had any idea that the plant was on the site. The site we were surveying is about 7 or 8 miles from the nearest public road and covers about 3,000 hectares. Professor George Swan (who wrote the 'Flora of Northumberland' originally found the plant on this site in 1973 new to south Northumberland. There is a very old record from north Northumberland but nobody has refound it there for a very long time. Here's another map from BSBI's website showing its British (and lack of Irish!) distribution. 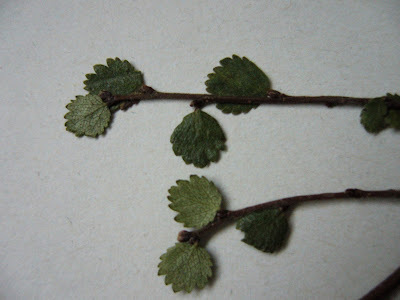 I believe that the 2 records in Lancashire are of introduced plants. 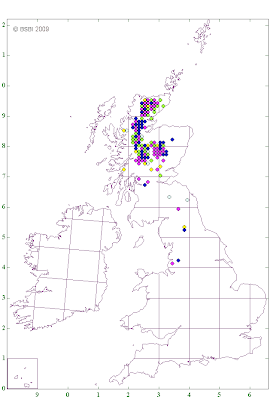 There is quite a scattering of records in the central highlands and the north of Scotland. This is an artic-alpine species whose core range is really in the artic and boreal zones. I couldn't resist including another photo of Tetraplodon mnioides (see the entry of 13 August 2007). 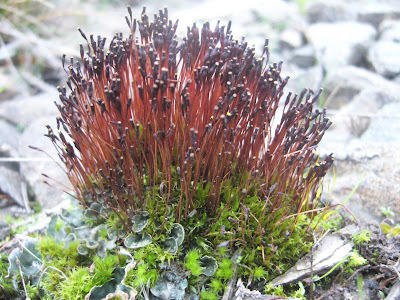 I think this is probably my favourite moss now - its definitely one of the most colourful species. It is still quite uncommon in Northumberland. There are only 16 records for it in VC67 - south Northumberland overall but I've found it 3 times in just over a year. I guess this probably means that it is increasing, but who knows really? I've always found it growing on dead sheep before, but this time there were 5 seperate small clumps on the forestry road leading up to the Betula nana site. I guess it must have been growing on deer dung here. Finding the Betula nana by accident was truly amazing. Members of our Botany group tried to find it a few times without any luck. Eventually Bill Burlton, Anne Pickering, Chris Irvine and myself went to look for it on 28/02/2008. Anne had some photos taken many years ago when the NHSN visited the site. We used these to match the hills in the background and eventually we found it. It was a long way from George Swans grid ref. I marked the area with a large stick. Perhaps thats what attracted Fiona to the site. There were a lot of plants covering an area of about 50 sq m.
By the way George Swan didn't discover the plants but that's another story.